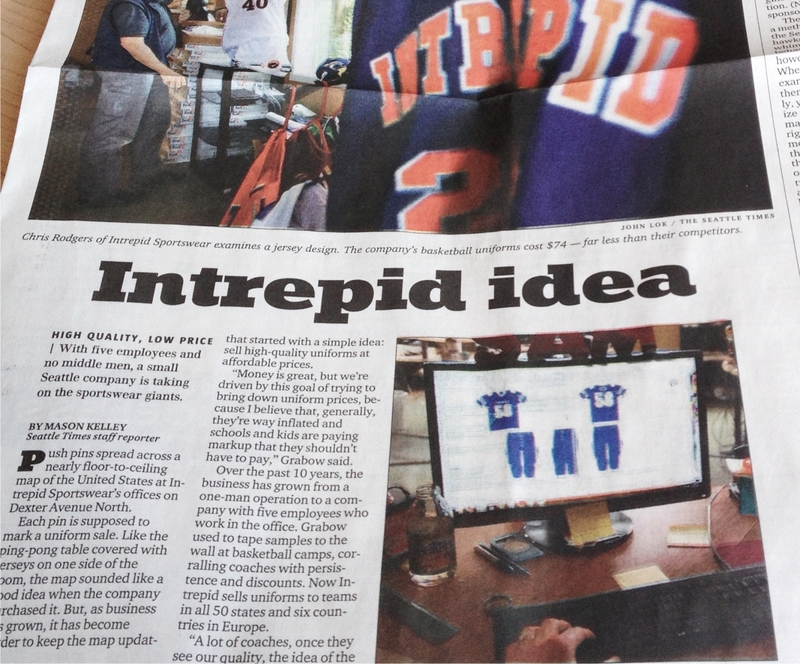 Intrepid Sportswear, started by Rob Grabow out of his dorm room at Gonzaga, started with a simple idea: sell high-quality uniforms at affordable prices. Push pins spread across a nearly floor-to-ceiling map of the United States at Intrepid Sportswear's offices on Dexter Avenue North. Each pin is supposed to mark a uniform sale. Like the ping-pong table covered with jerseys on one side of the room, the map sounded like a good idea when the company purchased it. But, as business has grown, it has become harder to keep the map updated. Intrepid, started by Rob Grabow out of his dorm room at Gonzaga University in 2002, is a jeans and T-shirt operation that started with a simple idea: sell high-quality uniforms at affordable prices. "Money is great, but we're driven by this goal of trying to bring down uniform prices, because I believe that, generally, they're way inflated and schools and kids are paying markup that they shouldn't have to pay," Grabow said. Over the past 10 years, the business has grown from a one-man operation to a company with five employees who work in the office. Grabow used to tape samples to the wall at basketball camps, corralling coaches with persistence and discounts. Now Intrepid sells uniforms to teams in all 50 states and six countries in Europe. "A lot of coaches, once they see our quality, the idea of the Nike uniforms that they see in their head, on TV, are just unattainable for their school budget," said Heather Jaccard, who joined the company in its infancy. "And suddenly it becomes, do I want this Nike uniform? Or, do I want this quality that I can fundraise for?" With budgetary issues schools now face, athletic programs are forced to cut costs whenever possible. Uniforms are one area where schools can save money. "The budget crunch is hitting everybody," said Kennedy Catholic boys basketball coach Don Hoffman. "We were up for new uniforms, so I got a bid from them and the price couldn't be touched by anybody else that I talked to. "The uniform quality is right up there with the best brands I've seen. I've seen a lot of samples from the big vendors � Nike and Russell and all that � and the Intrepid material is the same. They're almost identical, except for the price. You get them for a way better deal." When Grabow, 30, was a sophomore at a small high school in Alaska, he was a member of a talented team that made a run to the state tournament. The team held a fundraiser to buy new uniforms, spending about $75 on each. "We got them and the threads were coming out," Grabow said.A few years later, while trying to keep his hoop dreams alive, Grabow took time off as a sophomore at Gonzaga. He traveled to Australia to play for the Brisbane Spartans. The uniforms were nice. And they were inexpensive. When Grabow returned to Spokane, he knew what a good uniform looked like. He also knew what a high-quality product should cost. By the time he returned to Gonzaga, he decided to see if he could start selling uniforms. He made fliers on his dorm-room printer. "I have zero design eye," Grabow said with a laugh. "You've got a lot of heart, though," Jaccard joked. At the time, Grabow had no expenses, so his uniforms were cheap. But he needed to convince coaches. He worked camps and tried to coerce a coach into taking a chance. The first person to place an order was former Cedarcrest High School boys basketball coach Ray LaBate. "He was an answer to my prayers," joked LaBate, who found a flier at Gonzaga's team camp. "I had just bought some a year or two before that were pretty expensive. They were from a sporting-goods supply store and they were supposed to be good and yet they had the inked-on numbers. They were already starting to peel off, fade, and I really wasn't happy with them." Grabow's uniforms worked out so well, Cedarcrest's current coach, Mark Prince, ordered a new set from Intrepid. "The quality is great," LaBate said. The company has worked with more than 5,000 high-school teams � more than 6,400 teams total � so Grabow and his staff have an established product. Now they are working to expand their brand. The company brought in Jon Brockman, Snohomish native and former Washington basketball standout, as a spokesman. The Milwaukee Bucks forward was featured in an advertisement that ran in Slam magazine, bringing more exposure to the company. Sonics legend Jack Sikma has also signed on. The company has created uniforms for the rapper the Game, featuring dollar signs down both sides, and has worked with the American Basketball Association. "Our goal is to try to get as many teams as possible in the state and the U.S.," Grabow said. Jaccard added, "It's continual branding. We're continuing to get our name out there." Not having middle men helps Intrepid keep costs, and prices, down. Uniforms go straight from production to the customer. "Most companies have a manufacturing facility," Grabow said. "Then it goes through a distributor, then a wholesaler, then a retailer and then maybe a rep out to the customer. They have five levels of distribution." Everyone involved in the process needs to make money. Intrepid cuts out the middle-man markup. "You have a uniform that starts at 15-20 bucks costing $200 once it reaches the customer," Grabow said. Intrepid basketball uniforms cost $74 and are all-inclusive. "They are 100 percent custom," Grabow said. "You could have 12 logos, three colors, whatever. It doesn't change the price." Intrepid specializes in basketball uniforms, but offers options for all sports. All have a two-year warranty. What started with Grabow's desire to provide high-quality uniforms at an affordable price has grown into a sustainable company that continues to grow. One simple idea has blossomed into reality. "We're trying to make a difference, and when you're motivated in that way, your thinking is just a little bit different," Grabow said.